There are a number of rewards points programs in Canada, and I’ve written about a couple of the more popular ones – Aeroplan and Air Miles. For the movie theater enthusiast (like my spouse), there is really only one game in town, and that’s Cineplex and their SCENE points system. 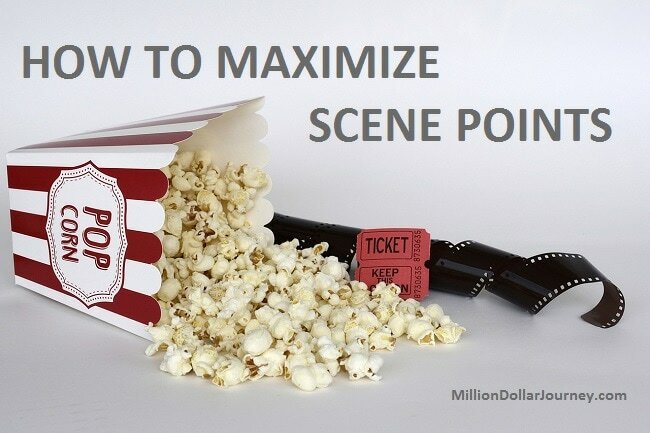 The SCENE program is a free points program that gives you points when purchasing movie tickets and concessions at Cineplex theaters and their online store. Once you sign up for the program, you get a SCENE card/number that gives you 100 points for every movie ticket that you purchase. Once you accumulate 1,000 points, you can redeem your points for a free movie. They have also recently expanded the program so that you can earn and redeem points at Sport Chek and Cara restaurants (Swiss Chalet, Montana’s, Milestones, Kelsey’s, East Side Mario’s, Bier Markt and Harvey’s). For Cara restaurants, it’s 1 SCENE pt/$3 spent, and 1 SCENE pt/$1 spent at Sport Chek. You can redeem 1,000 points towards $10 at either Sport Chek or a Cara restaurant. Get Multiple SCENE Cards – If you have a significant other and heading to the movies, chances are that you will be booking two tickets under the same purchase. The catch with SCENE is that you can only get 100 points/card/purchase. So even if you book multiple tickets, you will only get 100 points. To get around this, sign up your partner as well and add it to your SCENE online account. This will make sure that you get 100 points, and your partner’s account will also get 100 points. If you buy children’s tickets, you will get 50 points for every child. (A reader suggested to buy tickets in multiple transactions under the same account. That way, you get a free movie faster). Book Online – Another little trick is to book your tickets on the Cineplex website and you will get a bonus 20 points or 20%. Make sure to provide your SCENE card details (or login), during the check out process. Use Coupons – If you tend to eat out at Cara restaurants or shop at Sport Chek, there are often coupons available online that give you Scene point multipliers. A quick google search, and I just found 30x bonus Scene point bonus when eating at Swiss Chalet. The coupon offers 30 SCENE points for every $3 spent (instead of 1 pt/$3 spent). So a $60 meal would give you 600 SCENE points. Often around Christmas, there are a number of gift card bonuses. Right now, if you purchase a SCENE based Cara gift card, they will give you 20 points for every $3 you spend. Buy a $60 gift card to get 400 points, then use the gift card to pay for a $60 meal at Swiss Chalet and now you have 1,000 points – enough for a free movie. Tuesday Cheap Night – I’m not sure about other provinces, but on Tuesdays in NL, Cineplex offers movie tickets for $6.99 which is quite the discount from their Friday/Saturday night price of $12. If you are a SCENE member, you get an additional 10% off Tuesday ticket prices in addition to getting the full 100 points for the movie purchase. Boost your Points with a Free Credit Card – If you frequent the movie theater, one credit card that can offer you a lot of value is the no annual fee Scotiabank SCENE VISA Card. This free card will give you $1 SCENE pt for every $1 that you spend on the card, and $5 SCENE pts for every $1 spent at Cineplex. Perhaps this card deserves its own review, but essentially, you get a free movie for every $1,000 in every day spending (and 4 free movies as a sign up bonus). For the amount that we funnel through our credit card, we would never need to pay for another movie! Redeem – When you collect enough points for a free movie, you will have the option of using your points towards a movie when you use the Cineplex website. It makes the most sense to use the points when you head to the movies on pricier nights like Friday/Saturday nights, and save your points during weekly movies. My wife really enjoys going to the movies, so the SCENE program is a program that we keep up with. It often provides us with a free movie in a relatively short period of time – even without using the SCENE Visa. In terms of return on spending or value, if you restrict yourself to Tuesday night movies only, then your return on spending is very high at 21% return ($12 Friday night movie reward/$56.70 spent). If you only go to the movies on the weekends, and spend $12 per movie, then the return is lower at 11% ($12 reward/$108 spent). The return can get to really impressive levels if you take advantage of the tips listed above, especially if you sign up for the SCENE Visa (see description above). For SCENE users out there, how do you maximize your points? What is the Best Credit Card for Aeroplan Members? On Point #1 how do you connect yours and your spouse’s scene accounts? I only see the scenetourage but that needs 3 or more people. Hi Sam, login to cineplex.com, then click “Manage Profile” -> “My Wallet” and you’ll see a space at the bottom to add scene cards. To get around the 100 points per purchase limit (point 1) simply buy one ticket after the other (online of course:) for Tuesdays ) using the same Scene account – saves the hassle of two accounts and gets you to rewards faster. I’ve been going this for years – why Scene doesn’t reward PER TICKET is beyond me – anyone from Scene reading this? That is a great idea. Do you get the extra 20 points every time you book online as well? My 2 year old has a Scene card too. Me, my wife and young child are in one scenetourage group (3 people or more required). When 2 or more members of a group go to the same movie (same place / day), each member gets 50 points extra. Therefore, i buy my ticket with my card and buy a second ticket with wife’s card (online you can have 2 scene cards on same account). I didn’t know about the scenetourage…..will do that now too! Thanks for the info! When you use your scene visa to make purchases, if that store offers cashback make sure you take as much cashback as they allow. This will increase your purchase price, thus increasing your points earned. Then once a week just deposit the cash at your nearest ATM and put the cash back on the card. Costs you nothing, and you can add hundreds of extra points every week. If you take $40 cash back from every store you shop at, it adds up quickly. This of course works with any sort of credit card that offers rewards. I thought that cash back from stores were for debit cards only? Has anyone else ever taken the cash back option while using a credit card? I have never seen a store offer cash back on credit card purchases. Why would they do that? They pay a percentage fee on transactions… so they’d just be increasing the fee they pay with no increase in revenue. Debit is a flat fee for vendors, so it doesn’t hurt them to offer cash back on debit (other than depleting their cash on hand). It might depend on the store/cashier but I’ve never seen a store with a system limitation that prevents one from taking cashback from a credit card purchase. Most POS systems have a generic “Debit/Credit” button to push the transaction to the Moneris/Chase/etc. terminal. No harm in trying next time you’re out shopping. don’t you get hit with cash advance (interest) charges on the credit card? can see this working with a debit card not a credit card – banks generally don’t give you cash for free. Here’s a dumb question. My wife and I have been using the same scene card. How do I get a second card (aka: second account number), to do multiple deals? I can’t see anywhere that says to add another account to my scene account…or will they just have to be separate cards/accounts?? While eating at Swiss chalet tonight, we received 300 points, because we spent more than $40,00. We also bought a $50 gift card, and as I understand it, we should have received an additional points. Please advise if I am right, and if so, please add the additional 300 points to my card. Get the Carrot Rewards app, sync your Fitbit to it. Everytime you reach your step goal you get scene points. My husband and I also do the challenges. There is the personal of out of 14 days, reach your step goal 10 times and get 40 points. We also challenge each other and if we get 10 step goals completed in 7 days together we both get 40pts. So when you have a baby and don’t get out as often. What’s better then a free movie. Thanks for the suggestion Emma. I haven’t paid much attention to Carrot rewards, I will take a closer look. Carrot Rewards gives you points for answering health quizzes and meeting step goals too ?